With the discovery of the long-sought Higgs boson at the Large Hadron Collider (LHC), the world’s largest and most powerful particle collider, folks unfamiliar with the intricacies of particle physics might think the field has reached its end. But physicists gathered at the Large Hadron Collider Physics Conference in New York City June 2-7 say they are eager to move forward. Even amid discussions of tight budgets that make some proposed projects appear impossible, the general tenor, as expressed by leaders in the field, is that the future holds great potential for even more significant discoveries. 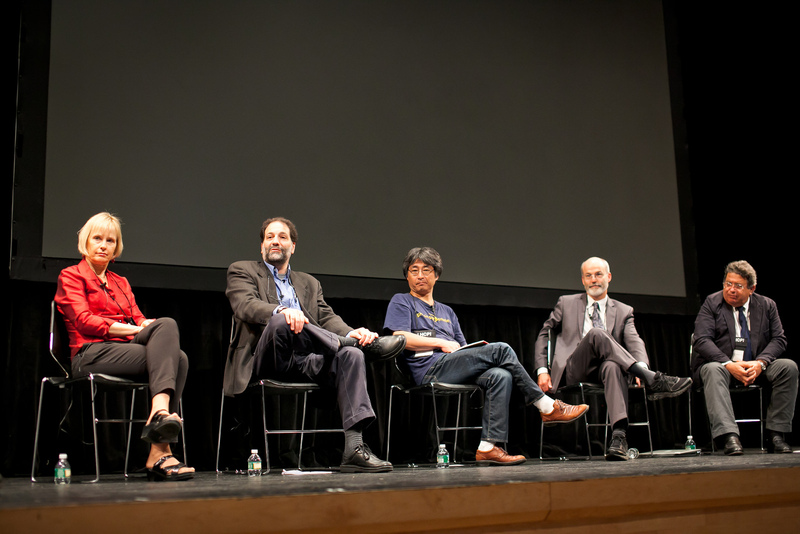 Physicists joined New York Times science correspondent Dennis Overbye for a discussion on the future of the field. Co-sponsored by DOE’s Brookhaven National Laboratory and Columbia University, the week-long meeting featured updates on key findings from the LHC’s four experiments (including a possible hint of new physics), advances in theory, plans for future upgrades, and even future colliders—as well as apanel discussion moderated by Dennis Overbye, a science correspondent for the New York Times. At Friday’s panel session, the Times’ Overbye had some questions of his own, perhaps more pointed that the public’s. He asked whether particle physicists’ streak of discoveries could be continued, whether the “glory days” for the U.S. were over, and what keeps physicists up at night. The panelists were realistic about challenges and the need for smart choices and greater globalization. But a spirit of optimism prevailed. Natalie Roe, Director of the Physics Division at DOE’s Lawrence Berkeley National Laboratory—the first to respond—said, “I’m going to flip the question [of what keeps me up and night] and answer what gets me up in the morning.” Following a long period of experimental and theoretical successes, including the discovery of the Higgs, she said, “this is a very exciting time. There are still a few remaining details … dark matter and dark energy. And these are more than details; they are 95 percent of the universe!” With a long list of techniques available to get answers, she said, there is much work to be done. University of California, Santa Cruz, physicist Steve Ritz, who recently chaired the Particle Physics Project Prioritization Panel (P5) and presented its recommendations for the future of the field, emphasized the importance of “telling our story,” staging and prioritizing future projects, and “aspiring to a greater program” that continues investments in crucial research and development to lay the foundation for future facilities. In an overview talk that preceded the panel discussion, Gianotti presented a range of such future projects, including two possible linear accelerators, one in Japan the other at CERN, and two possible circular colliders, one in China and one at CERN. The latter, dubbed FCC, would be a proton-proton collider 80-100 kilometers in circumference—on the scale of the Superconducting Supercollider (SSC) once planned for and later cancelled in the U.S. Such a machine would push beyond the research limits of even the most ambitious upgrades proposed for the LHC. Those upgrades, planned for data taking in Phase I in 2020 and Phase II in 2025, will begin the exploration of the coupling of the Higgs with other particles to explore the mechanism by which the Higgs generates mass, “electroweak symmetry breaking,” and searches for new physics beyond the standard model and into the realm of dark matter. But, to really get at the heart of those questions and possibly reveal unknown physics, the scientists say the need for even higher precision and higher energy is clear. “Our elders had it easy compared to our students,” said Siegrist, describing the physics challenges now open to exploration. He likened this moment in time to the end of a video game his son had played where, “at the end of the game, you end up on ‘the dark side’ and have to start again.” In physics, he said, the dark sector—exploring dark matter and dark energy—is going to be equally challenging to everything that has come before. To those who say building the future machines needed for this journey is impossible, Gianotti says, “didn’t the LHC also look close to impossible in the 1980s?” The path forward, she emphasized, is to innovate. Office of Science and Technology Policy, DOE’s Siegrist, and others agreed that the LHC is a great model for the field to stand behind and emulate for future collaborative projects. Blazey and Siegrist said OSTP and DOE would work together to discuss ways to smooth the process for such future multinational collaborations and to implement the recommendations of the P5 report. These include future U.S. work at the LHC, an internationalized Long Baseline Neutrino Facility located at Fermi National Accelerator Laboratory, and a role in Japan’s proposed linear collider, as well as continued investments in the technologies needed for future experiments. Said University of California, Irvine, physicist Andrew Lankford, chair of the High Energy Physics Advisory Panel (HEPAP) to whom the report was delivered, the P5 report describes a field optimized for scientific progress. “It’s a ten year strategic plan—way more than a collection of cool experiments,” he said. 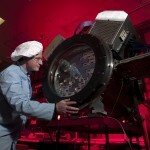 Brookhaven Lab’s particle physics research is supported by the DOE Office of Science. Karen McNulty Walsh is a science writer in the Media & Communications Office at Brookhaven National Laboratory. To celebrate its 30th anniversary, Discover magazine created a list of the The 12 Most Important Trends in Science Over the Past 30 Years. High-energy particle physics and Fermilab played a part in three of these 12 game-changing research break throughs. Here’s a look at these Discover-selected trends and Fermilab’s contributions to them. The first concept for what would become the World Wide Web was proposed by a high-energy particle physicist in 1989 to help physicists on international collaborations share large amounts of data. The first WWW system was created for high-energy physicists in 1991 under the guidance of CERN. 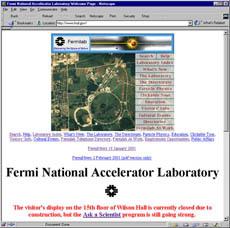 A year later, Fermilab became the second institution in the United States to launch a website. It also helped initiate the switch easy-to-remember domain name addresses rather than Internet Protocol addresses, which are a string of numbers. This switch helped spur the growth of the Internet and WWW. Particle physics also secured a place in sports history through its computing savvy. A softball club at CERN, composed of mostly visiting European and American physicists, many connected to Fermilab, was the first ball club in the world to have a page on the World Wide Web, beating out any team from Major League Baseball. The field of cosmology has advanced and created a more precise understanding of the evolution and nature of the universe. This has brought high-energy particle physics, cosmology and astronomy closer together. They have begun to overlap in the key areas of dark energy, dark matter and the evolution of the universe. Discover magazine cites as being particularly noteworthy in these areas the first precise measurement of cosmic microwave background, or CMB, radiation left over from the Big Bang and the discovery with the aid of supernovas that the expansion of the universe is accelerating. Fermilab physicists study the CMB with the Q/A Imaging Experiment, or QUIET. They study dark energy with several experiments, most notably the long-running Sloan Digital Sky Survey , the Dark Energy Survey, which will be operational at the end of the year, and the Large Synoptic Survey Telescope, potentially operating at the end of the decade or mid-next decade. During the last few decades the particle physics community has sought to build a mammoth international machine that can probe the tiniest particles of matter not seen in nature since just after the time of the Big Bang. Initially, this machine was planned for the United States and named the Superconducting Super Collider. Scientists and engineers from Fermilab help with the design and science suite of experiments for the SSC, which was under construction in Texas until it was canceled in 1993. A similar machine, the Large Hadron Collider in Switzerland, did take shape, starting operation in 2008. Fermilab played a key role in the design, construction and R&D of the accelerator with expertise garnered through the Tevatron accelerator construction, cutting-edge superconducting magnet technology and project managers. 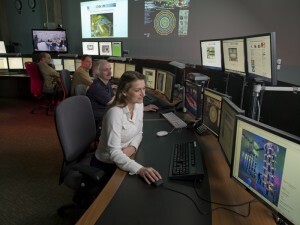 Fermilab now serves as a remote operation center for CMS, one of the two largest experiments at the LHC. Many physicists work on CMS as well as one of the Tevatron’s detector teams, DZero and CDF. The United States has the largest national contingent within CMS, accounting for more than 900 physicists in the 3,600-member collaboration. Fermilab’s computing division serves as one of two “Tier-1” computing distributions centers in the United States for LHC data. In this capacity, Fermilab provides storage and processing capacity for data collected at the LHC that is analyzed by physicists at Fermilab and sent to U.S. universities for analysis there. Discover magazine cited as a goal of the LHC the search for the Higgs boson, a theorized particle thought to endow other particles with mass, which allows gravity to act upon them so they can form together to create everything in the visible world, such as people, planets and plants. The LHC and the Tevatron are racing to find the Higgs first. The Tevatron has an advantage searching in the lower mass range and the LHC in the higher mass range. Theorists suspect the Higgs lives in the lower mass range. So far, the Tevatron has greatly narrowed the possible hiding places for the Higgs in this range.